This musk ox was taking a break pretty close to the road, at least close enough for Jack to get a photo. 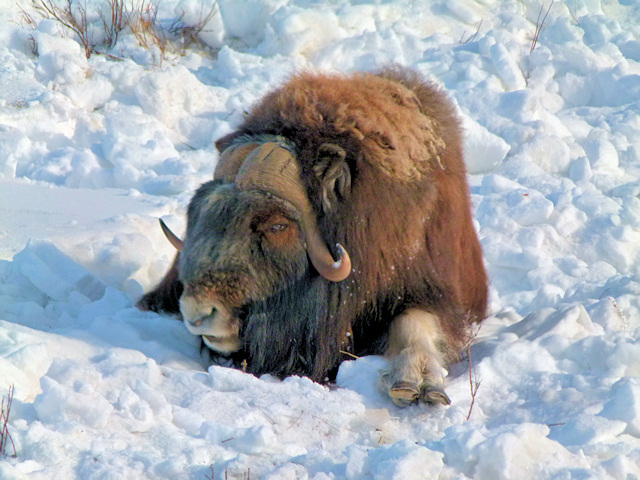 Musk ox are herding animals but this guy is a loner. 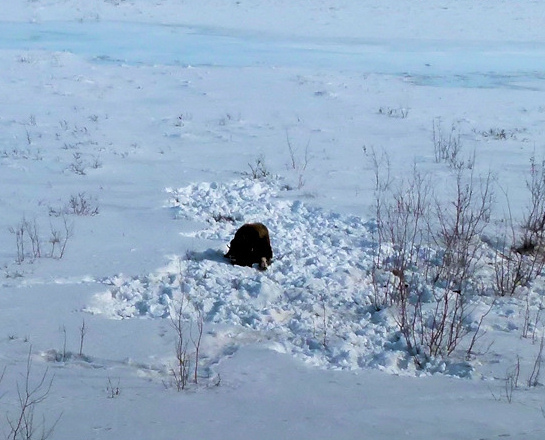 He doesn’t appear injured, but you can see he trampled the snow, probably looking for food, before he laid down for a rest. Maybe he was eating those little twigs sticking out of the snow. Not very appetizing! 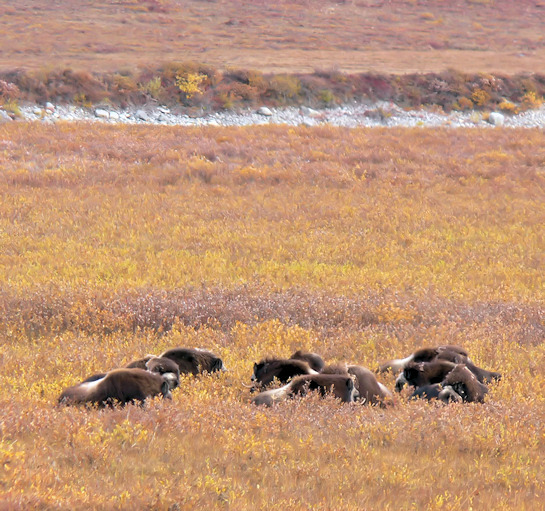 Jack sees Musk Ox all the time on the Dalton. He’s never heard of any driver hitting one (unlike caribou and moose who have a bad habit of running out into the road). Good thing, since Musk Ox weigh almost three-quarters of a ton! Here is a small herd resting near the road back in 2008 when I went with Jack to Prudhoe. If you ever get a chance to drive the Dalton, do it in the fall! It’s unbelievably beautiful. This entry was posted in Wildlife and tagged alaska, animal, dalton highway, environment, mammal, musk ox, nature, north america, north slope, snow, winter. I want to go to Alaska so bad. It’s on the bucket list. I really want to see a Musk Ox when I go. Alaska is so beautiful. Please put up more scenery pictures. Thank you for these.it brings more of a human aspect to the show. Do you have pictures Jack took of The Northern Lights? Yes, we have photos of the northern lights that we will post soon. If you want to see a couple that were taken from our house, go to my other blog, . Thanks Evon!